All health information provided on this web site should not be considered medical advice or a substitute for a consultation with a physician. We are unable to provide specific medical advice. If you have a medical problem, contact your physician for help. 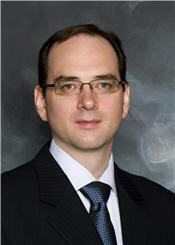 Dr. Harris attended medical school at the University of Alberta in Edmonton, Alberta, Canada. He was then accepted into the Otolaryngology – Head and Neck Surgery residency program at the University of Alberta where he developed his interest in Head and Neck Oncology. To further pursue this interest he moved to New York City where he undertook subspecialty fellowship training in Advanced Head and Neck Oncology and Microvascular Free Flap Reconstruction of the Head and Neck at The Mount Sinai Hospital under the direction of Dr. Mark Urken. After completing his fellowship in New York, Dr. Harris returned to the University of Alberta where he entered a full-time academic practice. Currently, Dr. Harris is a Professor at the University of Alberta, Department of Surgery and holds the position of Site Chief, Otolaryngology – Head and Neck Surgery and Fellowship Director, Advanced Head and Neck Oncology and Microvascular Reconstruction, at the University of Alberta. He is actively involved in research and has published extensively. He holds positions on local, provincial, national, and international committees and has been honored for his teaching contributions. Dr. Harris is a member of the Long Range Planning Committee, Regional Representative, Nominating Committee and the Provincial Representative, CPD/CME Committee for the Canadian Society of Otolaryngology – Head & Neck Surgery.